After coming 3G, no one like 2G's speed. But charges of 3G internet is very high as compare to 2G. But I have a trick, with this you can access unlimited 3G internet at very cheap price, very very less then 2G. This Airtel trick works on both mobile and data card (modem) connections. It sounds good, isn’t it? So lets try it. It’s hundred per cent free and hundred per cent working on only airtel. I suggest readers to take the smallest 3g pack with maximum validity, You can use the the Rs.45 3g plan with 150 Mb data balance with 30 days validity, its cheapes and longest plan. What we do here? we will make the 150 Mb data balance to unlimited data balance. 2. Download and install Hex VPN 1.1 on your pc. You can download Hex VPN 1.1 from below link, provided at the end of the post. That's it, :) Now you can browse as much as you want without your data balance being deducted. So here you go, now you have got unlimited 3g for 30 days at just Rs.45 cost. 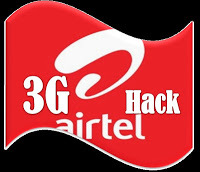 Reconnect the connection every 45 minutes, otherwise this free unlimited 3g trick will be blocked on your Airtel SIM. It deduct only 400kb every time when you connect.